When Nebraska police officer and divorced mother of three Kathryn Bolkovac saw a recruiting announcement for private military contractor DynCorp International, she applied and was hired. Good money, world travel, and the chance to help rebuild a war-torn country sounded like the perfect job. Bolkovac was shipped out to Bosnia, where DynCorp had been contracted to support the UN peacekeeping mission. She was assigned as a human rights investigator, heading the gender affairs unit. The lack of proper training provided sounded the first alarm bell, but once she arrived in Sarajevo, she found out that things were a lot worse. At great risk to her personal safety, she began to unravel the ugly truth about officers involved in human trafficking and forced prostitution and their connections to private mercenary contractors, the UN, and the U.S. State Department. After bringing this evidence to light, Bolkovac was demoted, felt threatened with bodily harm, was fired, and ultimately forced to flee the country under cover of darknessbringing the incriminating documents with her. Thanks to the evidence she collected, she won a lawsuit against DynCorp, finally exposing them for what they had done. This is her story and the story of the women she helped achieve justice for. 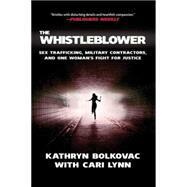 Kathryn Bolkovac is a former police investigator who cooperated with Human Rights Watch to expose the misconduct and human rights abuses committed by U.S. military contractors such as DynCorp. She lives in Lincoln, Nebraska, and Amsterdam, the Netherlands. Cari Lynn is the author of numerous books of narrative nonfiction, and has written for magazines and newspapers including O, The Oprah Magazine; Health; Good Housekeeping; and the Chicago Tribune. She lives in Los Angeles.